Happy Happy Happy Saturday!!! Hope you are like me and TOTALLY overindulged on Halloween treats!!! Mmmmmmmmmmm Reece peanut butter cups!!! 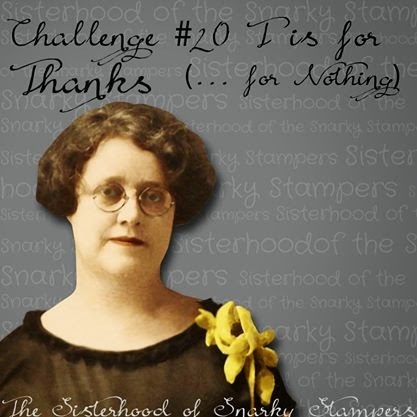 The snarky sisters are back with another fun challenge this week....T is for Thanks (...for nothing). You can make a Thank You card...or a Thanks for Nothing card...ha ha ha ha ha ha I love any challenge that allows me to get my snark on! Visit the SoSS BLOG for all the details on this challenge and while you are there, show our Guest Designer MAJO and the rest of the sisters some crafty lovin!! SISTER JESSI pointed out to me that the silhouette trick or treaters reminded her of It's The Great Pumpkin Charlie Brown....when poor old Charlie Brown got a rock in his trick or treat bag. 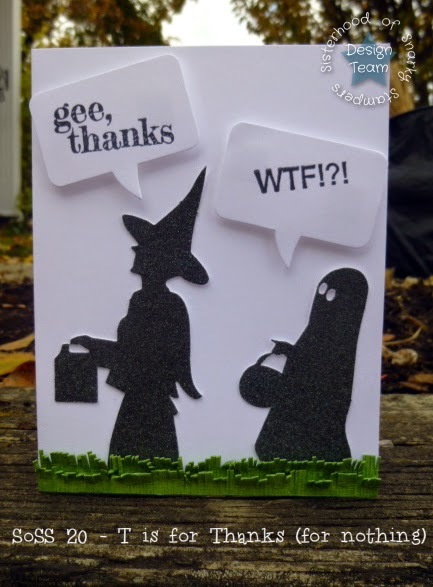 I think you won Halloween with this card -- I love it!!! Love, love , love it. I'm sure that's what would be said if you only gave a sucker. yum reeses pieces too. I adore this - simple yet so effective and different. Thanks for the smile. OMG! Bhaaaaa Haaaaa Haaaaa! Gasp, giggle,snort wheeeeeze. That's just too effin funny! I wish I could be YOU (with your brain) when I grow up, Grin! Great, Great card! You should just have the foul language warning as your banner. LOL Great card. Oh, Donna--no raisins or rocks for you!! Reeses P-nut butter cups all the way! LOL!! :) YUM!! I can't love this card enough! You can just hear the sarcasm dripping in the witch's voice, and the ghost!! OMG! Too funny!